Compton gives a nice history of the rise of American science and engineering prowess as well as making some pretty good predictions here. Some answers to this question seem clear, and others seem very uncertain. It is safe to predict that the 2002 person will be clothed with synthetic textiles which will not fade, shrink or wrinkle and in which the desired creases will stay put. Atomic energy will be in use for special, but not for general, power purposes. Gasoline will be coming more from oil shale than from oil wells, and may be already produced commercially from coal. Cancer may then be as well under control as tuberculosis is now. Television may have proved to be an instrument to perpetuate dictatorship, or to make the democratic process more effective, depending on the trends of control and public concern. Cancer is certainly not under control, though we do have much better treatments and shale oil is only now starting to take off but he nailed clothes, atomic power and TV. As an aside; the design of this article is really nice, however, for people who are supposed to predict the future I wish the PM’s designers would have shown a little consideration for schmucks like me who have to scan their articles. Why didn’t they realize that putting an illustration of balloons behind the text of the article would play havoc with my already finicky OCR software? (Lest you think I’m picking on PM, Modern Mechanix also had a nasty habit of doing this. 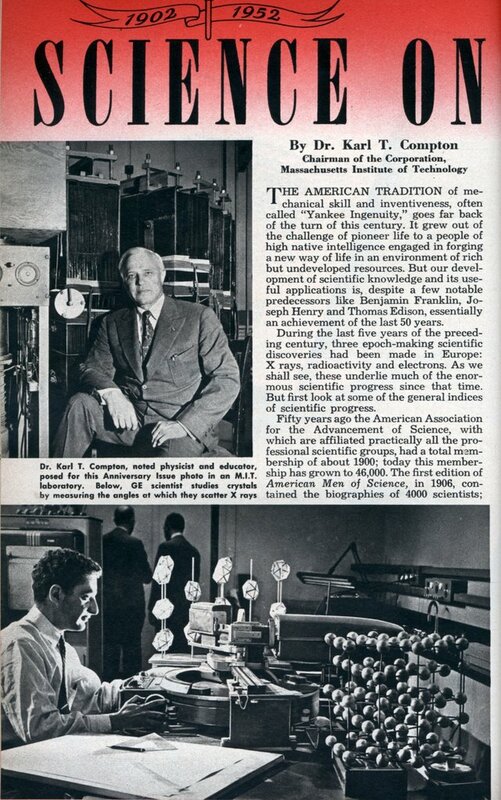 Chairman of the Corporation, Massachusetts Institute of Technology THE AMERICAN TRADITION of mechanical skill and inventiveness, often called “Yankee Ingenuity,” goes far back of the turn of this century. It grew out of the challenge of pioneer life to a people of high native intelligence engaged in forging a new way of life in an environment of rich but undeveloped resources. But our development of scientific knowledge and its useful applications is, despite a few notable predecessors like Benjamin Franklin, Joseph Henry and Thomas Edison, essentially an achievement of the last 50 years. During the last five years of the preceding century, three epoch-making scientific discoveries had been made in Europe: X rays, radioactivity and electrons. As we shall see, these underlie much of the enormous scientific progress since that time. But first look at some of the general indices of scientific progress. Fifty years ago the American Association for the Advancement of Science, with which are affiliated practically all the professional scientific groups, had a total membership of about 1900; today this membership has grown to 46,000. The first edition of American Men of Science, in 1906, contained the biographies of 4000 scientists; the latest edition, in 1949, contained 50,000. In 1901 in an old barn in Schenectady, the General Electric Company established the first modern industrial-research laboratory. Its staff consisted of Dr. Willis R. Whitney and one assistant. Today there are some 2800 industrial-research laboratories, with aggregate staffs of at least 70,000. I have been unable to locate any estimate of the national expenditure for research in the United States at the beginning of the century. The amount was probably too small to induce any agency to go to the trouble of assembling\the figures. In 1920 it was about $60,000,000. In 1930 it was $166,000,000; in 1940, $355,000,000; at present, certainly over $2,000,000,000. What are some of the influences which have contributed to this remarkable increase in America’s, scientific activity? Basically, it is part and parcel of the similar worldwide trend. Every investigator who starts out to study one problem finds a half dozen new ones. Every scientist who publishes the results of his research stimulates critical and constructive thinking about his subject by thousands of fellow scientists all over the world, and many of them make his work as their starting point for new discoveries. Every development of a new scientific instrument or method opens the way for its application in new areas by the entire scientific fraternity. Thus scientific activity proceeds in compounded geometric progression. But there have been several stimulating influences which have been particularly effective in the progress of science in America during the past 50 years. The first of these influences was the departure from almost total dependence on the old European universities for post-graduate training in research. When I did my postgraduate work in Princeton University in 1910-1913, I was one of the first substantial group of ambitious young scientists who sought their higher education in America, instead of going for it to Germany, England or France. To be sure, most of our professors had themselves been trained in, or imported from, Europe. But from about that date it became increasingly possible to secure in this country a quality of postgraduate education and indoctrination into the spirit and methods of research which was on a par with what had previously been available only to those few who had been able to seek them in Europe. A second influence was the stimulus provided by the exigencies of war. We were then faced with the necessity of mobilizing every resource to meet and overpower a highly skillful and technically competent adversary. Scientists and engineers were mobilized in teams and their abilities were extended to the limit to develop methods for handling chemical warfare, control of Artillery fire, the submarine menace, air combat, communications, new explosives and new materials for war production. To do these things, every resource of science and technology was drawn upon and further developed. The results were so strikingly important that, for the first time in our history, the public became convinced that science was a resource worth exploiting for the national welfare as well as for the intellectual joy of discovery. The result was a significant increase in the prestige of science, and its financial support by government, industry and educational institutions. By and large, it can be stated that the great development of American chemical industry dates from the World War I period. 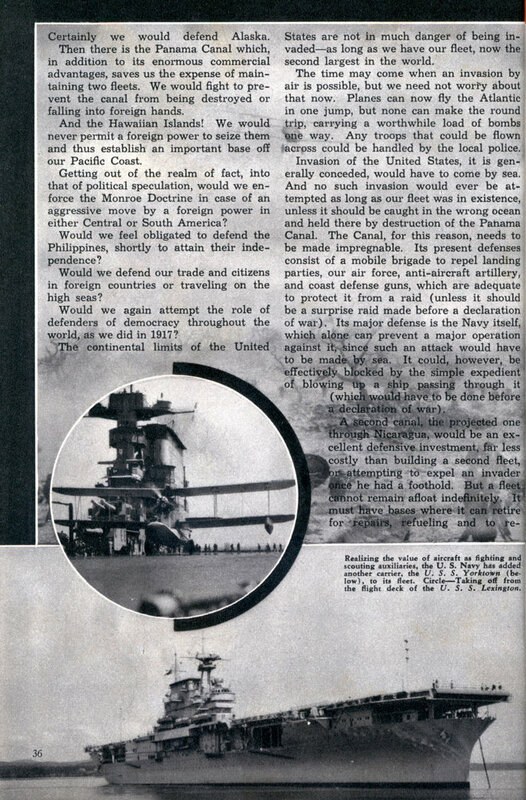 This type of stimulation of systematic group attack on technological problems was even more pronounced during World War II, with complete mobilization of the nation’s scientific resources under the Office of Scientific Research and Development and the military departments. Guided missiles, radar, bombsights and fire-control instruments, penicillin and hundreds of other developments culminating in the atomic bomb, are too freshly in mind to need comment. But the result of these successes is reflected in the great postwar movement to amplify still further the development of science and its applications for defense, industrial, agricultural and medical research. Recent evidences of this trend are the formation of the National Science Foundation and the doubling of the military appropriations for research and development. Other evidence is found in the strong support which many industrial corporations are now giving to scientific research and the training of research workers in our educational institutions. One further important influence is the support given by the great foundations to the development of science through the education of outstanding young scientists. No small part of America’s progress in aviation is due to the opportunities created by the Guggenheim laboratories for aeronautical engineering at a selected group of universities and engineering schools. The Guggenheim fellowships and research grants from the Carnegie Corporation and others have been very helpful. Most significant of all was the establishment in the early 1920s by the Rockefeller Foundation of a great program of postgraduate fellowships, on a nationwide scale, in the physical, biological and medical sciences. This kind of program was undertaken for the purpose of building up the strength of the country in pure science, since World War I had interrupted the normal educational program and had diverted many scientists from their fundamental scientific fields into the work of practical applications. One proof of the effectiveness of this fellowship program is the very large proportion of the present heads of research organizations and university science departments, as well as the predominant leadership in World War II scientific work, supplied by former holders of these National Research Fellowships financed by Rockefeller. With this background of the general progress of scientific activity during the past half century, especially in the United States, and of some of the contributing factors, we pass to the more specific consideration of major achievements. Whole libraries could be written, and have been written, on this subject. The story is told of a distinguished physicist of Oxford University whose large study is lined on all four walls with scientific books from floor to ceiling. A lady visitor, on being shown his study exclaimed, “Professor, how do you ever find time to read all these books?” He replied, “Madam, I don’t read them. I write them.” How can I hope to do justice to this subject in my few remaining remarks? In August 1912, Popular Mechanics polled nearly a thousand scientists from all over the world to select The Seven Wonders of the Modern World. In the order of votes cast, these were selected as wireless telegraphy, telephone, airplane, radium, antiseptics and antitoxins, spectrum analysis and X ray. In 40 years’ retrospect, we can applaud the insight which then led to these selections, for much of scientific progress since those days has been by amplification of these scientific wonders. Take, for example, the wireless telegraph and the telephone. Whereas in 1912 we could send dot-dash messages by wireless. we can now send voice conversation and pictures. In other words, we now have radio and television. By further development of wireless we now have radar, by which we can locate otherwise-unseen objects, do blind navigation, measure the distance to the ionosphere or the moon and do many other things. Similarly, the telephone of today is a far more powerful and flexible instrument than was the telephone of 1912. These developments have come principally from the tremendous advances in the art mathematical computers and countless other devices. Today I should group all such things together in a modern wonder of the worldâ€”electronics. Similar is the story of radium. For 50 years after the discovery of radioactivity, its interest was purely scientific, except for a few practical uses like cancer therapy and luminous watch dials. It was the phenomenon whose study threw the most light on the inner constitution of atoms, just as spectrum analysis and X rays gave us our knowledge of their outer structure. But studies of radioactive substances led scientists to try various methods of prodding into the innermost secrets of the nuclei of atoms, and for this purpose were devised the various types of atom-smashing machinesâ€” high-voltage generators, cyclotrons, linear accelerators, betatrons and synchrotrons. With these it was found possible at will to realize the old dream of the alchemists: To transform atoms into different types of atoms. This has been the most fundamental scientific discovery of our generation. But, out of this work with radioactivity, and guided by Einstein’s deduction from his famous theory of relativity that mass and energy were equivalent and interchangeable (if only means to effect the interchange could be found), came the atom bomb and the prospect of atomic power. Once the clue to the release of atomic energy through nuclear fission was given by the observations of Hahn and Strassman in 1939, the developments came with dazzling speed. Knowledge of this German discovery was brought to the United States promptly by the Danish scientist, Niels Bohr. Within a month after the original discovery, it had been verified and extended in several laboratories in this country and in at least three European countries. Within a year, more than a hundred scientific papers had been published on the subject, and there had been conferences on nuclear fission in Washington and, we are told, in Moscow. A few months later some possible military applications had been envisaged, secrecy was clamped down, thousands of Allied scientists were mobilized on the project, and on August 6, 1945, an atomic bomb was dropped to devastate Hiroshima and bring the war to a speedy end in the Pacific. Now our Atomic Energy Commission supervises the greatest scientific and engineering project of all time, and the governments of all nations of any significance have similar agencies, in some proportion to their means. Undoubtedly, we have as yet only a glimmering of the potentialities of this new science of nucleonics. Certainly, as of this date, atomic energy must be accorded a high place among the modern wonders of the world. Space permits only mention of several other significant wonders. I have chosen to enlarge on those above, in order to illustrate the way in which such things come about. Equally interesting stories could be told about modern scientific wonders in other fields. I think of plastics and synthetic textile fibers; of antibiotics like penicillin, streptomycin, aureomycin and the others of this fast-growing group; of the sulfa drugs and others which fool a germ or virus into feeding on them to its destruction; of the discoveries in genetics which have led to the breeding of agricultural products of greater yield, food value and resistance to disease; of the role of enzymes in life processes; of the regulation of the endocrine glands by chemical agents (hormones) like insulin and cortisone; of our knowledge of the internal constitution of the stars and of the atomic fuel which keeps them hot; of the identification of new fundamental constituents of matter such as neutrons, positrons, mesons and photons; of the widening use of radioactive isotopes to study and control a great variety of scientific and industrial and medical phenomena; of catalysts and chemical-engineering techniques which permit mass production of essential chemicals. If one were to evaluate new developments in terms of their impact on our ways of living rather than on the elegance and fundamental character of scientific discovery, then other wonders should be added to the list. The modern automobileâ€”about which the Encyclopedia Britannica says: “Until 1909-1912 the automotive industry was in general chiefly concerned with developing a product that at least would operate”â€”has revolutionized our pattern of living and doing business outside of the home. Within the home, probably any housewife would say that the modern ways of preserving, packaging and distributing food have similarly revolutionized the feeding of the family. 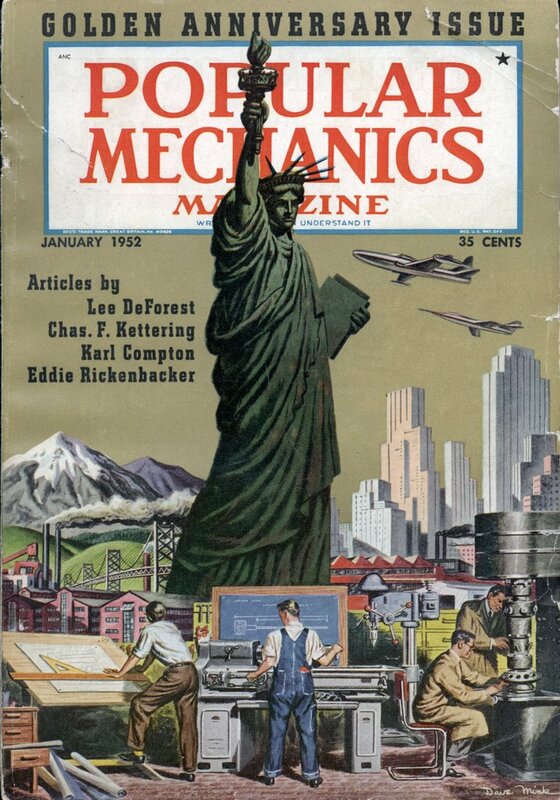 All of these things, and more, are products of scientific research within the span of the 50 years during which Popular Mechanics has played its useful role of spreading information and creating interest and ambition in those things which are so significant in this rapidly expanding technological age. Many of these things are only the early stages of still more significant developments in the future. What will these future developments be? If we could reverse our sights from 50 years of past achievement to the next 50 years of scientific progress, what would we see in the year 2002? Some answers to this question seem clear, and others seem very uncertain. It is safe to predict that the 2002 person will be clothed with synthetic textiles which will not fade, shrink or wrinkle and in which the desired creases will stay put. Atomic energy will be in use for special, but not for general, power purposes. Gasoline will be coming more from oil shale than from oil wells, and may be already produced commercially from coal. Cancer may then be as well under control as tuberculosis is now. Television may have proved to be an instrument to perpetuate dictatorship, or to make the democratic process more effective, depending on the trends of control and public concern. But let me close with mention of one great threat which hovers over the uncertain future. Certain to be critical, sooner or later, is the problem of overpopulation in a world of limited and diminishing natural resources. The conquest of disease, the elimination of famine, the hoped-for abolition of war all result in increasing the population and the demands for production of food and goods. Can technological progress in production and in discovery of substitutes for exhaustible natural resources keep ahead of these increasing demands? On the answer to this question, or, alternatively, to some intelligently applied social control of population growth, depends the fate of civilization on this planet. Thus far technology has done pretty well in the race. Improved agricultural production and distribution now support a vastly larger world population than could have been fed by the techniques of a century ago. But without rapidly continued progress both in food production and in the arts of living together in crowded communities, population increase may have forced on our citizen of 2002 the beginnings of some terrific social upheavals. Let me describe just one of several directions in which science may help us to keep ahead of overpopulation disaster. I refer to cultivation of the sea for food; not by stocking it with little fish, but by far more fundamental chemical and biological methods. Why should ways not be found to “farm the sea” with the same scientific skill with which we farm the land? The bases of all sea life are the algae, vegetable organisms which provide the food for the small fish. The fish population is limited by the amount of this algae food, which in turn appears to be limited by the amount of nitrate salts in sea water illuminated by the sun. Hence one project for increasing the supply of fish is by fertilizing the sea with nitrates. This may produce useful results in restricted sea areas, but the sea is very big, and perhaps this proposal is too gigantic to be practical. Another approach, which can probably be made practical, is to grow algae in transparent pipes or channels through which sea water is slowly pumped. These channels may cover any area exposed to the sun, and nitrates or other enriching chemicals may be added to the circulating sea water. The algae would be of strains specially selected to produce fats or proteins which can be extracted and processed. What the economics of this type of farming may prove to be remains to be discovered as the method is developed and tested. All that can be said now is that sooner or later something radically new must be developed in the food-production line to keep ahead of population growth, and this scheme seems worth working on. In any case it illustrates the sort of new and unexpected technological development which may be stimulated by the problems of living 50 or more years hence. Whether we look backward or forward, or examine the present situation we see that it is the continual concern with things yet to come which is the inspiration and motive power of the scientist. Charlie… Did you have to type the article by hand? Couldn’t the colors be stripped away after scanning? I read that the most OCR unfriendly project ever was the Websters Dictionary. Each word had up to 30 different typestyles and sizes. Jay: No I just had to make a bunch of corrections by hand. Doing the OCR is always the biggest pain of posting here, but I’ve gotten pretty quick at it. There are small problems with almost every article. But after I spell check and clean them up with some macros I’ve written it’s not that bad. The worst things to OCR are articles where the text isn’t in rectangular sections, eg, when they wrap around a circular inset or something. The second worst is fractions. It hates fractions. 1/2 always ends up as % or something. Um, yes James. That’s exactly what he said. Well the technology to turn coal into oil does exist and the Nazis used it when their oil supplies became insufficient but the process is amazingly inefficient and is an environmental disaster.